The 10 Best Mexican Restaurants in California! Thanks to California’s heritage, and proximity to Mexico, the state is filled with Mexican restaurants from top to bottom. Check out some of the best Mexican restaurants in the state, which range from hidden holes in the wall that have drawn critical acclaim to gourmet options that combine California’s agricultural bounty with culinary traditions. In a neighborhood that constantly has new restaurants opening and closing, El Toreo remains a mainstay. The no-frills old-school style booth has some of the spiciest salsas and tastiest enchiladas anywhere. There’s also a jukebox and happy hour specials. El Huarache Azteca is a small spot with a big reputation for having some of the best huaraches anywhere. Revered by LA Times food critic Jonathan Gold, be sure to try some of the freshly made aquas frescas to go with your choice of flavorful meat. 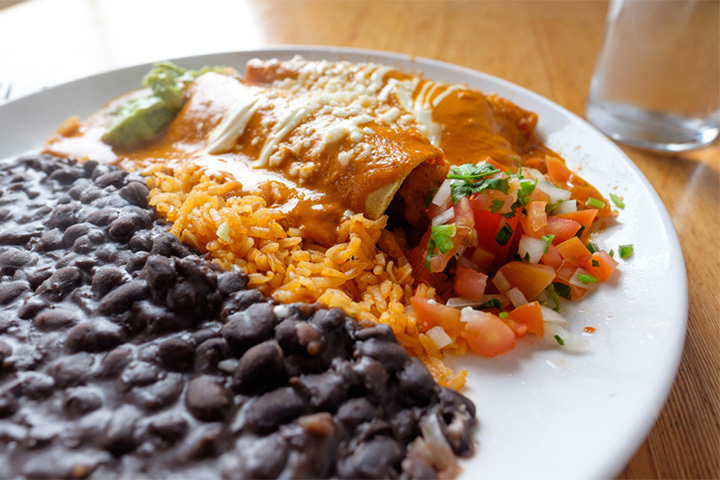 La Super-Rica Taqueria has become famous thanks to its notoriety as the favorite Mexican restaurant of culinary queen Julia Child. Once nothing more than simple taco stand, La Super-Rica now has a bigger menu and a bigger seating area. Be prepared for a wait before making your selection at the counter. Flor del Rio is one of the places that you could pass by if you didn’t know that it serves some of the best goat in the city. There’s no menu, so just be prepared to enjoy whatever delicious dish comes out of the kitchen. La Simpatia could be overlooked as you pass through Guadalupe to nearby Pismo Beach, but it’s a true treasure. La Simpatia has some of the best Mexican food in California so don’t fill up on the generous and delicious bean dip. Nopalito combines the art of Mexican cooking with the Bay Area’s focus on using organic and seasonal ingredients. The casual cool restaurant has two locations that both tend to have long wait times and no reservations, so bring your appetite accordingly. El Molino Central brings a chef’s point of view to a casual eatery. Using seasonal and locally sourced ingredients, the menu changes according to the offerings of the surrounding farms. Try the fish tacos or the sopas. Open since 1933, Las Cuatro Milpas is a San Diego institution that still has people lining up around the block for a bite of deliciousness. If you’re in the area be sure to stop by for a taste. Chichen Itza is a family-owned business that brings the flavors of the Yucatan region to Los Angeles. Here you will find dishes that don’t pop up on every other menu in town, all lovingly prepared. Making everything from scratch using traditional methods has made Chichen Itza popular with the food crowd and you can make the recipes yourself with the help of the restaurant’s cookbooks. San Francisco’s Mission District is probably best known for its burritos, which are somehow different than those you find in other California cities. Taste the difference at La Taqueria, which brings people all over the country looking to experience the carnitas.